Aniseed Pimpinella anisum is also known as Anise or Wild Anise. This herb is not to be confused with Star Anise. 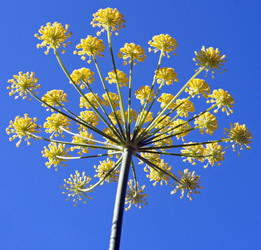 Pimpinella anisum grows to about 3 feet with white flowers, and does have a taproot so it doesn’t transplant very well. Plant it where you plan to keep it. It prefers sandy to loamy well-drained soil and lots of sun. The seeds are the part used, so you don’t have to destroy your crop to harvest this herb, as you do when using roots. The seeds are only produced during hot summers. If it doesn’t get hot enough it simply won’t produce them. When planting seeds should be sown 1/4 inch deep in warm soil, about 1-2 seeds per inch. If you are planting in rows, the rows should be spaced about 18 inches apart. Once the plants are growing thin them to about 6 inches apart. You can also start plants in the greenhouse earlier in the year and place them in your garden after the last frost. Aniseed has been used since ancient Egypt and Rome as a flavoring in food and drinks as it has a flavor similar to licorice. Hippocrates recommended aniseed for coughs, and it was used as a digestive aid as well. Aniseed is used to help alleviate bronchitis, persistent coughs and also to loosen mucous. It can be taken internally, as well as used in oils or salves to be used as chest rubs. Other uses: It is also used to help stimulate appetite, alleviate colic and gas (flatulence) and may help milk production for breastfeeding moms. It has also been used as a tea to help alleviate oily skin and some of the symptoms of menopause. It is thought to help with menopause due to its oestrogenic properties.